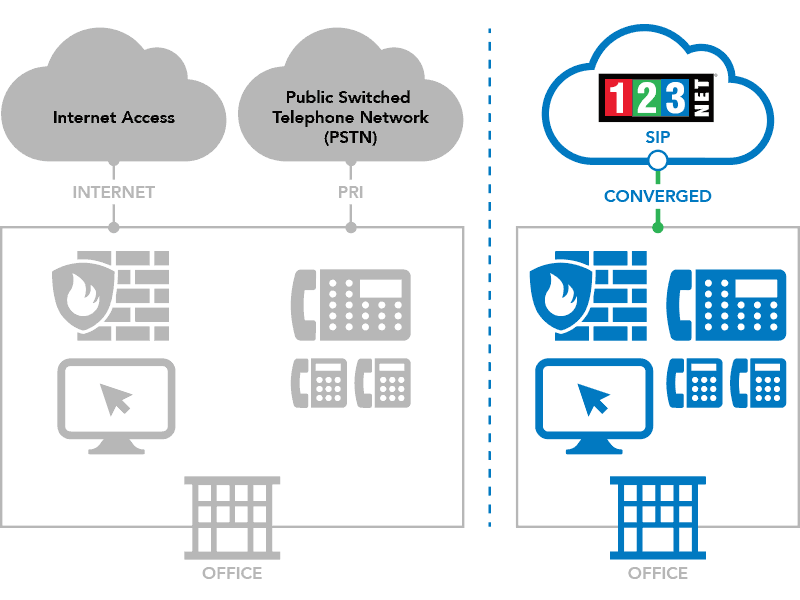 Unlike traditional telephony, where bundles of physical wires were delivered from the service provider to a business, a SIP trunk allows a company to replace traditional fixed Public Switched Telephone Network (PSTN) lines with PSTN connectivity via a SIP trunking service provider on an IP network. The IP-PBX on the enterprise networks connects to 123Net via an enterprise border element. The border element could be a SIP-capable firewall or a SIP-aware edge device, working alongside an existing enterprise data firewall. Feature rich technology such as voice compression allows you to efficiently manage voice communications and bandwidth. Make phone calls from your phone system without the need of additional cabling. 123Net SIP helps you eliminate the cost of maintaining separate circuits for both voice and data.